Remember that pecan pumpkin butter? Today I’m going to how you to use half of it and, at the same time, take care of breakfast (or dessert) for the week. These non-cinnamon “cinnamon” rolls use pecan pumpkin butter, brown sugar, and roasted pecans for the filling. After baking, the warm rolls are topped with a cream cheese icing spiked with bourbon, vanilla, and molasses. They’re sweet, they’re rich, and they’re intense. 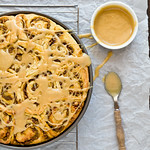 Just like the Apple Cinnamon Rolls we made a couple of weeks ago, the recipe is simply our favorite “plain” cinnamon roll recipe dressed up with a different filling. And a little booze. You assemble them the evening before, let them rest in the fridge overnight, let them rise the next morning, and then bake. If booze for breakfast isn’t your thing, replace it with milk. If you’re thinking “I’m going to have the bourbon out pouring a glass anyway…” then you and I were likely separated at birth. Just kidding. I don’t drink bourbon. For breakfast. 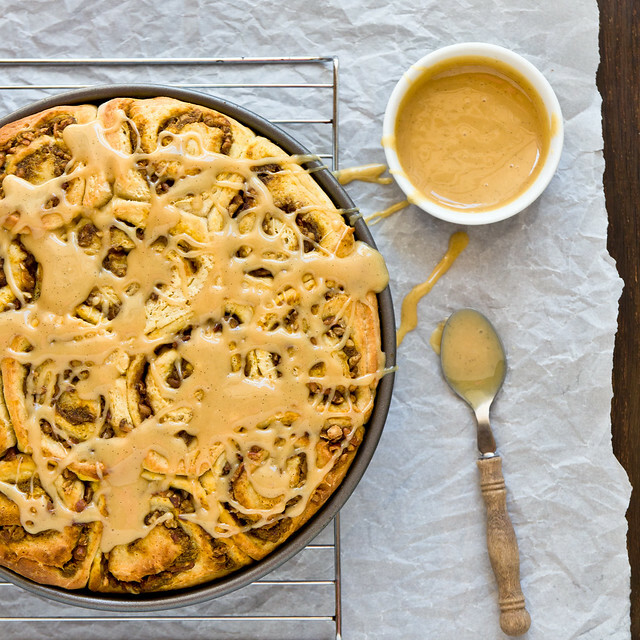 Dress up a plain cinnamon roll for fall with pecan pumpkin butter and an icing spiked with bourbon and molasses. Just before the dough is finished, preheat the oven to 375. Spread the pecans on a baking sheet and roast 5-7 minutes, until brown and fragrant. Spread the pecan pumpkin butter over the dough, leaving the top 1-inch bare. Spinkle the pecans and brown sugar over top. While the rolls are cooling, beat the cream cheese, bourbon, molasses, vanilla, and powdered sugar together until smooth. Drizzle over the rolls and serve. these look sinful. i can’t wait to give them a try! I hope you’re writing a book soon because I seriously love your pics and way with words! I love that there are so many ways to dress up the same roll. Fantastic! Seriously, Shawnda, STOP IT! All this bourbon and pumpkin is sending me into a sugar-laced fall coma! would love to include these in my friday link roundup. ok to steal the photo too? if not please email me. Now this is an exciting cake ~ love that frosting! Great recipe! My only suggestion for those about to make the dough: warm up the buttermilk and sprinkle instant yeast over it. Let stand for 10 min, then add this mixture into the eggs, vanilla….mixture. Most yeast doughs require this step and I was surprised not to see it in the instructions here. Since I followed the recipe as is, the grains of instant yeast felt strange and rough in the dough as it was kneaded. Looking forward to eating! These look amazing. Do they freeze well? Minus the frosting, they’ll freeze fine!